Gabon is a beautiful Central African destination known for its lush national parks, which together account for more than 11% of the country's total land mass. These parks protect a bounty of rare wildlife - including the elusive forest elephant and the critically endangered western lowland gorilla. Outside its parks, Gabon boasts pristine beaches and a reputation for political stability. The capital, Libreville, is a modern urban playground. Gabon is located on Africa's Atlantic coast, just north of the Republic of Congo and south of Equatorial Guinea. It is intersected by the equator and shares an inland border with Cameroon. Gabon covers a total area of 103,346 square miles/ 267,667 square kilometers, making it comparable in size to New Zealand, or slightly smaller than Colorado. The capital of Gabon is Libreville. According to the CIA World Factbook, July 2016 estimates put Gabon's population at just under 1.74 million people. The official language of Gabon is French. More than 40 Bantu languages are spoken as a first or second tongue, the most prevalent of which is Fang. Christianity is the dominant religion in Gabon, with Catholicism being the most popular denomination. Gabon's currency is the Central African CFA Franc. Use this website for up-to-date exchange rates. Gabon has an equatorial climate defined by warm temperatures and high humidity. The dry season lasts from June to August, while the main rainy season falls between October and May. Temperatures remain constant throughout the year, with an average of around 77°F/ 25 ℃. The best time to travel to Gabon is during the June to August dry season. At this time, the weather is better, the roads are more navigable and there are fewer mosquitoes. The dry season is also a good time for going on safari as animals tend to congregate around water sources, making them easier to spot. Gabon's capital is a thriving city with five-star hotels and upmarket restaurants for the luxury traveler. It also offers beautiful beaches and a choice of lively markets that together provide a more authentic insight into urban Africa. The Museum of Arts and Traditions and the Gabon National Museum are cultural highlights, while the capital is also known for its vibrant nightlife and music scene. Bordered on one side by the Atlantic Ocean, beautiful Loango National Park offers a unique blend of coastal adventure and inland safari. Sometimes, the wildlife of the forest even ventures out onto the park's idyllic white sand beaches. Top sightings include gorillas, leopard, and elephants, while nesting turtles and migrating whales can be spotted on the coast in-season. 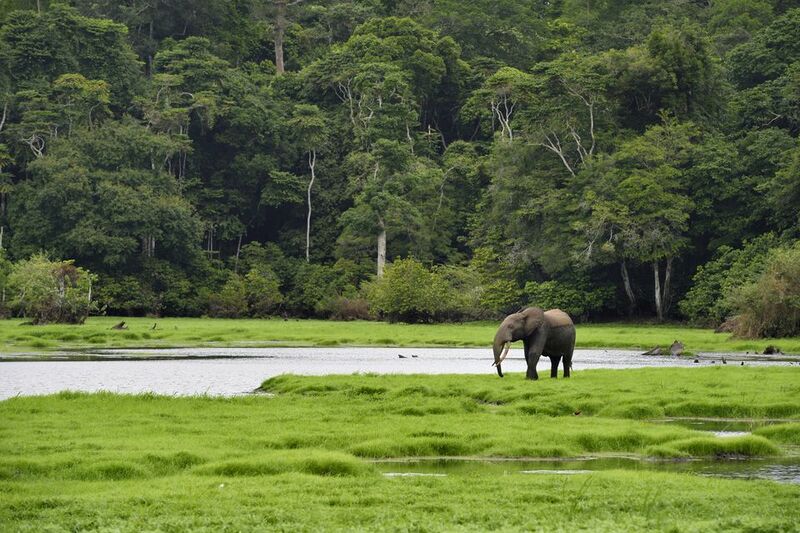 Lopé National Park is the most accessible national park from Libreville and is, therefore, the most popular destination for wildlife viewing in Gabon. It is especially known for its rare primate species, including western lowland gorillas, chimpanzees, and colorful mandrills. It is also one of the best spots for birders, providing a home for bucket list species like the grey-necked rockfowl and the rosy bee-eater. Separated from Libreville by the Gabon Estuary, Pointe Denis is the country's most popular seaside resort. It offers a number of luxury hotels and several stunning beaches, all of which are perfect for watersports ranging from sailing to snorkeling. Nearby Pongara National Park is renowned as a breeding site for the vulnerable leatherback turtle. Libreville Leon M'ba International Airport is the main port of entry for most overseas visitors. It is serviced by several major airlines, including South African Airways, Ethiopian Airways, and Turkish Airlines. Visitors from most countries (including Europe, Australia, Canada and the U.S.) need a visa to enter the country. You can apply for your Gabon visa online - see this website for more information. Yellow Fever vaccination is a condition of entry into Gabon. This means that you will need to provide proof of vaccination before you are allowed to board your plane. Other recommended vaccines include Hepatitis A and Typhoid, while anti-Malaria medicine is also required. Zika Virus is endemic in Gabon, making travel inadvisable for pregnant women. For a full list of health advice, see the CDC website. This article was updated and re-written in part by Jessica Macdonald on April 7th, 2017.